With longer days and warmer weather, spring is definitely in the air. That means it’s the perfect time to plan ahead for summer: you may already have picked your ideal decking, so now it’s time to look at ways to get it ready for the sunny weather to come. Whether it’s as simple as choosing a new lounger and throw, or whether you want to complement your deck with colourful plant life, our assistant product manager, Indi Sarkaria, looks at how you can add a complementary splash of colour to your deck. One of the great advantages of a brand-new deck is that it is the perfect canvas to showcase your personal style. Trex decks are available in a range of beautiful neutral tones, from striking greys to warm browns. That makes them the ideal backdrop for colourful furniture, tableware, and flowers. This year, I’ve been feeling particularly inspired by the Pantone Colour of the Year – Living Coral. This vibrant, warm shade was inspired by nature which makes it perfect for the great outdoors. Living Coral is versatile and eye-catching and would pair perfectly with the pinkish tones of our recently-launched Enhance Naturals Rocky Harbor colour. But it would look equally striking with shades like the dark grey Calm Water from our Enhance Naturals Collection, and with classic, natural browns like Transcend Spiced Rum. Adding flowering plants to your deck not only adds colour and texture, they’re good for the environment too, encouraging pollinators like bumblebees and butterflies. Even if you don’t have flowerbeds, you can grow flowers and shrubs, even small varieties of trees, in pots and planters. If you’re taking inspiration from Pantone, there are plenty of beautiful coral pink blooms out there to consider. The ‘Coral Charm’ peony has glorious bowl-shaped flowers which will start to appear in late spring – beginning as coral, then changing to orange and yellow as the season progresses. The ‘Cottage Apricot’, a member of the chrysanthemum family, makes a charming addition to more traditional English gardens, with is brightly coloured coral pink and yellow flowers. If you want a low-maintenance native plant that will still add a splash of colour, the bilberry is a great option. Its delicate bell-shaped flowers bloom in spring or early summer, adding a pretty pink blush to the shrubs. The berries – which appear from July – are not only edible but delicious, and by planting them you’ll be being kind to bumblebees too! 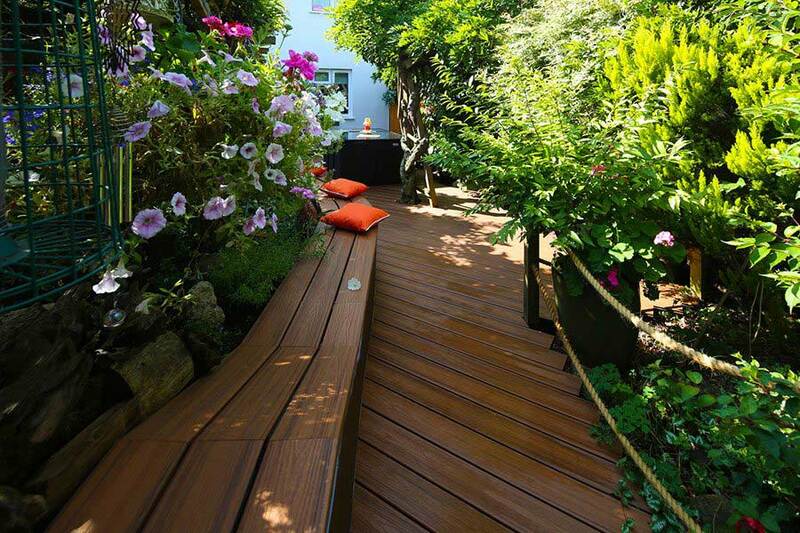 You have your deck, and you’ve filled it with colourful, fragrant flowers: so it’s time to sit and enjoy the sunshine! Fortunately, there are lots of stylish additional touches that will not only add interest to your deck but create a comfortable haven for you to enjoy too. Deck chairs can add real retro charm to your decking, harking back to the glory days of the great British seaside. They’re lightweight and convenient, as you can fold them away for storage in the winter months. This traditional striped deck chair sling in coral adds a subtle hint of colour without being too in-your-face, and it’s ideal when paired with a warmer wooden-effect Trex deck. For something a bit bolder but still functional, this parasol is one of my favourites: the cantilevered arm means you can position it at the edge of the deck and it will create plenty of shade without being in the way! The bright colour tones with all our Trex decks, but the black powder-coated stand makes it a perfect match for Island Mist. If you don’t want to splash out on new furnishings, but you’d still like to incorporate some colour, why not go for some comfy outdoor or even a soft throw to keep the chill off on summer evenings? Trex decks are so versatile and beautiful that you could use any contrasting or complementary colour – but we think the colour of the year, Living Coral, is a great place to start. 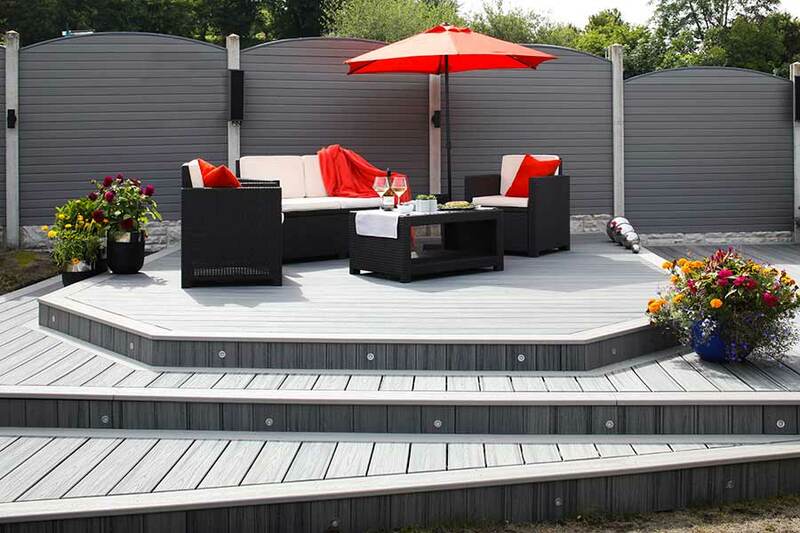 Don’t forget you can order your Trex decking samples if you need some extra inspiration.